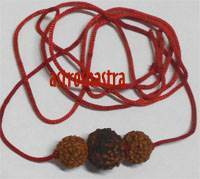 Rudraksh and Pearl Mala - This Mala is made up of 55 Five Mukhi Rudraksh beads and 54 natural round Pearl beads, constituting 108+1 beads mala. 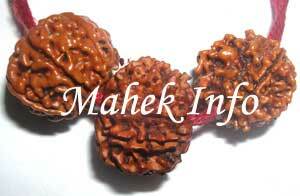 The Five Mukhi Rudraksh and pearl are well known for their blood pressure controlling properties. 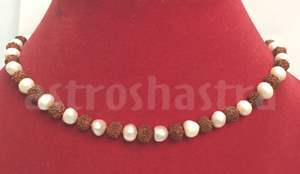 This Mala is made up of 55 Rudraksh beads and 54 natural pearls , constituting 108+1 beads mala and are very effecting in controlling high Blood Pressure. 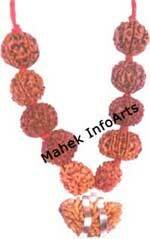 This mala is recommended to people having heart problems and high blood problem. 1. It enhance the power of planet Moon in the Horoscope. 2. It controls the Blood pressure as Moon is the controller of Blood pressure (High or low). 3. It helps in controlling the disease occured due to malefic Moon in the Horoscope like cold, chest congestions etc. 4. 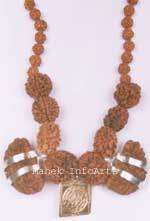 Energies of rudraksh beads negate the evil energies around the wearer. 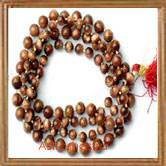 How to wear Rudraksh and Pearl Mala ? 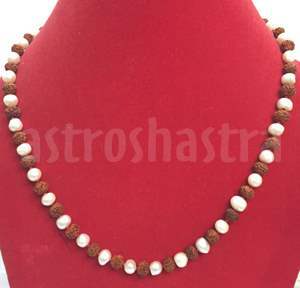 Mantra to Chant “Om namah Shivay' and Planet Chandra Beej Mantra " Om Shraam Shreem Shroom Sah Chandraye Namah" is the mantra that has to be chanted to wear this Mantra for about 108 times.